Amimon, the industry innovator for wireless HD video and control transmission with zero latency, is debuting their enhanced CONNEX wireless HD video transmission solution at this year's IBC. The enhancements include extended support for a greater variety of gimbals, remote controllers and flight controller telemetry devices as well as improvements to the on-screen display and compatibility with other 5GHz transmitters on the drone. A newly implemented configurable Fail-Safe mechanism further adds to the safety and reliability of utilizing CONNEX. The enhanced CONNEX will be demonstrated by pilots flying a variety of drones in the specially designed flying cage on the Amimon booth (#11.C75). CONNEX will also be exhibited in the IBC Drone Zone at 2:30 pm on Saturday, September 12, and at 11am on Monday, September 14. "We developed CONNEX to increase content creation capabilities for broadcasters and other drone users, and these enhancements build on that mission, giving creative and production professions more options than ever before," said Ram Ofir, CEO, Amimon. "With the fast growth of drone use, we are extremely aware of safety concerns and continue to address these with new safety features as well." CONNEX has been optimized to support PPM gimbals and DJI CAN-Bus flight controller telemetry, adding to existing support for SBUS gimbals and the Mavlink protocol of 3DR. Co-existence with other 5GHz transmitters has been improved to support drones that feature a secondary transmitter; the on-screen display has been upgraded to include yaw and directional arrow features. A fail-safe mechanism for gimbal control has also been implemented, helping to improve safety and reliability. Delivering full HD video quality with zero-latency transmission with a range of up to 1,000 meters (3,300 feet), the plug-and-fly CONNEX is ideal for broadcast, inspection, aerial photography, crowd control and other applications that require real-time control of both camera and drone. 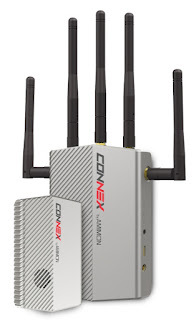 The CONNEX kit includes all antennas, cables and connectors required for air and ground unit set-up. A robust 5GHz radio with sophisticated 2x5 MIMO and automatic channel selection (AFS) allows CONNEX to ensure resilient connectivity at all times, free from interference from UAV controls and other 2.4GHz radio links. CONNEX's multicasting feature supports up to four screens simultaneously while maintaining excellent HD video. Wireless HD video connectivity is creating a revolution in content creation and consumption. Amimon, a market leader in zero latency wireless HD video, has invented exclusive technology to harness the power of mobile cameras and fixed video sources, to bring HD content to remote display screens or distribution switches. Amimon's systems utilize its core technology to deliver convenience and flexibility to create, transmit and view content on remote devices with the highest image quality. 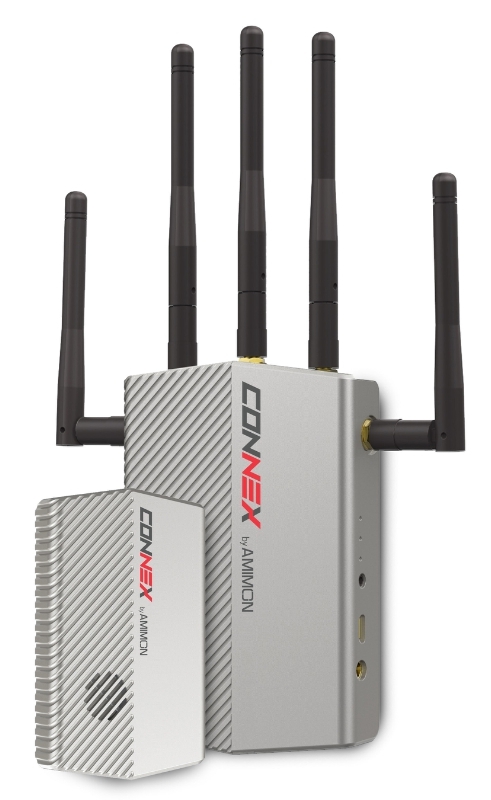 0 comments on "Amimon To Unveil New Enhanced Software for CONNEX at IBC - New Features Added to the Innovative Wireless Video Link for Drones"